This bowl belongs to a long tradition of purely utilitarian ceramics that dates back to Neolithic times. Wares made for ordinary household purposes, for cooking, storage and carrying water had never been as decorative as the funerary pieces. Made from fine-grained, grey clay, these everyday pots were either made by using a pad and beater or by using coils of clay. The unglazed surface was usually decorated with a fine impressed pattern, sometimes achieved through pressing cloth into the damp clay. From Neolithic times, through the Shang dynasty, and into the Han dynasty, unglazed earthenwares of practical but rather crude shapes continued to be made for domestic purposes. 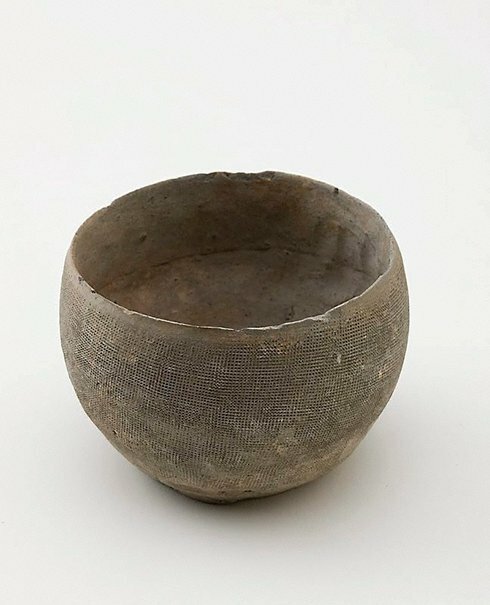 It should be mentioned that while the earthenware tradition continued, already in the Shang dynasty potters were making stoneware, that is, dense, hard pottery, impervious to water and fired at about 1200 degrees Celsius. It was also in the Shang dynasty that potters deliberately began applying glazes to the stonewares. However, glazed stonewares were only a small percentage of Shang ceramics, albeit significant in a consideration of the historical development of Chinese ceramics. Jackie Menzies, 'Early Chinese Ceramics', AGNSW, 1983. cat.no. VII. (illus.). Early Chinese Art , Sydney, 1983, not paginated (illus.). cat.no. VII. See 'Further Information' for text.